These easy cheese enchiladas will be a big hit with your family! Adding the rice makes for a great dinner meal! 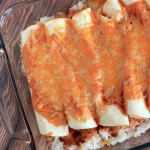 This is a great cheese enchilada recipe that your kids can help make. Dividing up the cheese in even portions is a great way to practice fractions. We love enchiladas at our house and they make great leftovers. These cook up well in an 8 x 11 baking dish. The first problem I had was not knowing what to do with the extra tortillas since I typically buy a package that has 10-12 tortillas. Instead of having odds and ends in my freezer until the next batch of enchiladas, I decided to simply make more. All I did was add an additional bag of cheese, a second can of sauce, and doubled the spices. We love cheese in our house so doubling the cheese was welcomed. Just use a full bag in the mixture and use the second bag to cover the top after the first 30 minutes of baking. Since I was already doubling the recipe, I decided to use 2- 8×8 glass dishes so I could use 2 different sauces. I make one pan with green chile and one with red. The Old El Paso enchilada sauce works great and there is a variety of red and green sauce in mild, medium, or hot. I’ve also substituted the cheese mixture for browned ground beef prepared with taco seasoning. How would you change up these cheese enchiladas? Easy Cheese Enchiladas makes for a great dinner. 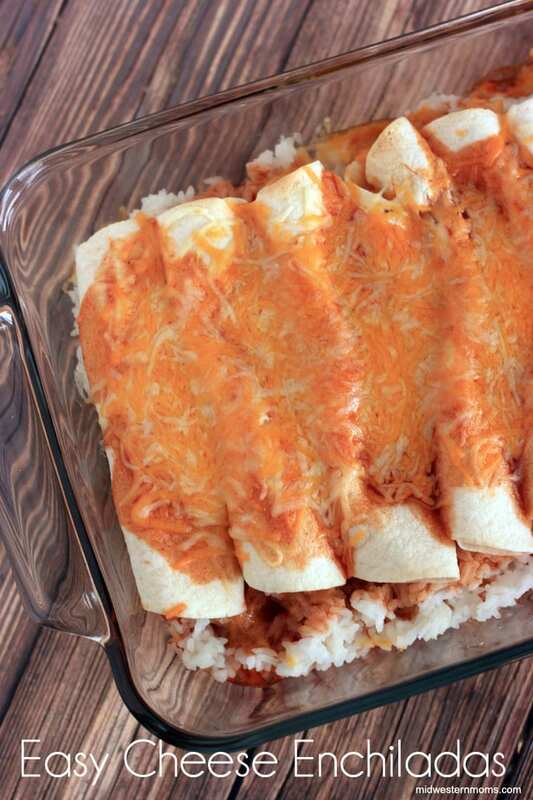 Adding the rice makes for the perfect side for these enchiladas. Kids will love this dish! Cook your rice according to the instructions. Spread the rice on the bottom of an 8 x 11 baking dish. Pour about half the enchilada sauce on top of the rice. Mix your spices with 1 1/4 cups of cheese in a bowl. Add enough enchilada sauce to the cheese mixture just to make it stick together. Warm up the tortillas but placing them in the microwave for about 10 seconds. Divide the cheese mixture evenly between the 8 tortillas. Roll the tortillas into small cylinders and place them on top of the rice in the baking dish. Make sure it is seam side down. Spoon the rest of the enchilada sauce on top of the enchiladas. Bake at 350 degrees for 30 minutes. Remove foil and add remaining cheese to the top of the enchiladas and bake for another 5 minutes. Enchiladas are my favorite. Ohhh yum! !